Former Supreme Court Judge and present Chairman of the Press Council of India, has been taking the media and the legal fraternity by storm for a while now, with his explicit revelations on his blog as well as Facebook. His has now divulged his rendezvous with Justice Kapadia at a time when he was a part of the collegium and Justice Balakrishnan was the Chief Justice of India. 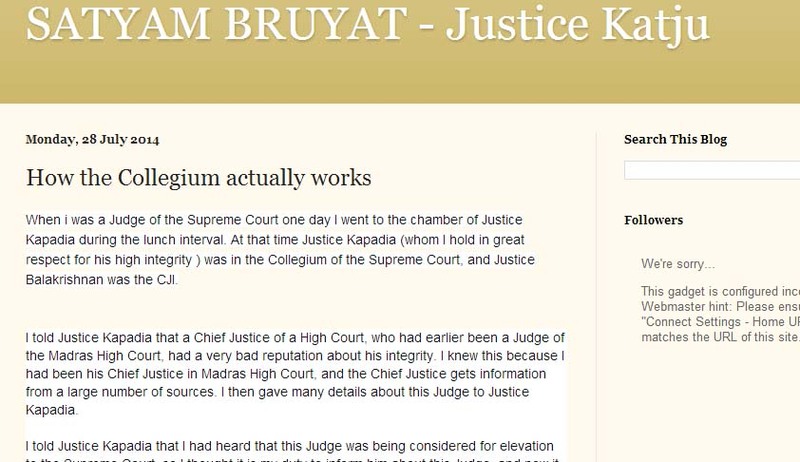 He writes that he then informed Justice Kapadia that a “Chief Justice of a High Court, who had earlier been a Judge of the Madras High Court, had a very bad reputation about his integrity.” He also gave several details about this Judge to Justice Kapadia. His confrontation with Justice Kapadia was the result of the ‘corrupt’ judge being considered for elevation by the collegium. He preferred informing Justice Kapadia and not CJI Balakrishnan because according to his information, Justice Balakrishnan was pushing for elevation of that Judge to the Supreme Court. The judge was nevertheless recommended for elevation. However, his elevation was protested by the lawyers of Tamil Nadu, who furnished documentary proof of that Judge's corruption, e.g. large scale land grab done by him. He was then transferred to Sikkim. An impeachment motion was also brought against him in the Parliament but he resigned before it could be passed. Justice Kapadia later justified his actions, saying that the CJI was adamant on elevating this corrupt judge as he (Justice Balakrishnan) was earlier a Chief Justice of Madras High Court and knew that the allegations of corruption about him were untrue. The minute details about this ‘corrupt’ judge plainly point towards his identity. The blog was removed from the original site a few hours back. However, the cached version is available here. It was also put up on Newslaundy, available here. The timing of his earlier allegations has been questioned by many. Former Supreme Court Judge and present Chairman of Press Council of India, Mr. Markandey Katju stirred a storm, when he posted shocking revelations on Facebook, regarding the conduct of three former Chief Justices of India, CJIs Justice Lahoti, Justice Sabharwal and Justice K.G. Balakrishnan in granting extension and confirming a corrupt judge. Read the Facebook post here. In continuation of the allegations, Justice Katju posted Six questions to Justice Lahoti in his blog. Read the questions here.